The best microphone for rap vocals will emphasize the clarity in your rapper’s lyrics, and effectively transfer the energy and punch of the rapper’s performance through a dense or bass heavy mix. Finding a good condenser mic, then, is key to getting the right results. The Rode NT1-A is a great microphone for any kind of vocals, and offers the best value for its price point. If cost is an issue, don’t look any further than the MXL V67GS and it’s related models. “Cheap” it is, but the quality is staggering for the price. Check it out. 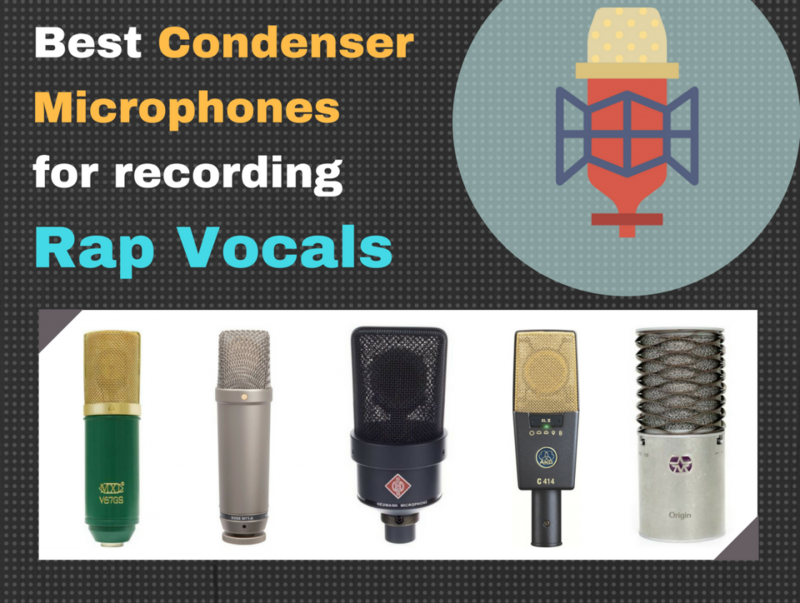 To help you in coming to an easy decision, we’ve select 5 of the best vocal condenser mics. Each will be great in their own way, but there’s enough flavor to choose the one that’s right for the results you want to produce. 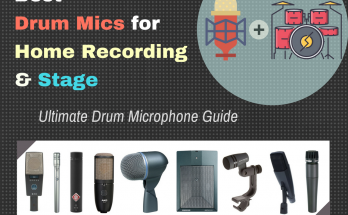 If this is your first time looking for mics for recording rap vocals, then take a look at the buying guide section, where we compile some of the best information you need to consider before spending your money. Overview A low cost microphone with an inspiring design and surprisingly high quality specs for the price. One of the most top rated rap vocal microphones on the market. Super quiet, uncolored and clear sound, and for a reasonable price. A favorite among rappers and engineers, offers that modern upfront “presence” that gives rap vocals the “punch” it needs, albeit at a premium price. A legendary microphone that sounds balanced and upfront, with lots punch and warmth. A favorite among rappers, broadcasting and music engineers, with lots of features, though at a premium price. New to the market, this a great high-quality inexpensive microphone for rap, with one of the best value for money on the market. There are two other choices to select from as well, for you consideration. But the first three should be your strongest picks, and if they didn't satisfy you for any reason, you have a couple others (high and low budget) that I've found serve as excellent alternatives to the three condenser microphones considered best for recording rap vocals. If you need help deciding, take a look at the buyer's guide section of this article to figure out how to make the best choice, and which one's right for you. The MXL V67GS rap mic is an affordable large capsule condenser microphone for recording rap vocals. The microphone was designed specifically for recording the vocals of R&B, rock, country and hip-hop. 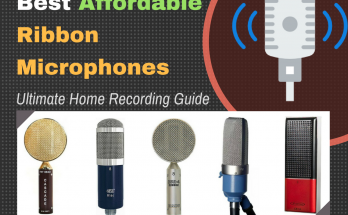 It is also the cheapest microphone on this list, which will be great if you’re on a budget, but want to get the best sound from a rap microphone. Despite the price, some customers have reviewed that it is comparable to microphones many times the cost, making it a bargain for anyone who looking for a new condenser microphone for rap vocals, whether it is your first mic, or an addition to your microphone collection. The MXL V67GS rap mic is a beautiful condenser microphone. In fact, it is not very discreet at all in looks. With a green body and gold plated capsule, you or your rapper will definitely feel the motivation and vibe when rapping into this microphone. In addition to its attractiveness, it’s also compact, measuring at only 7.24 inches in height, and 1.85 inches in diameter, and weighing only 1.3 lbs., you could easily take this microphone around with you. The quality of the design and build itself is also quite good, with a solid design that, to me, looks reminiscent of an old-school microphone. Again, even though this vocal microphone is low cost, it really looks like collector’s high-end classic. The MXL V67GS rap mic uses a pressure gradient condenser capsule to mic rap vocals. The capsule is a 32mm gold-sputtered diaphragm that has a sufficiently wide cardioid polar pattern. The produces a small rising presence peak that rounds off toward the top, while remain flat in the low frequency range. This is good for rap vocals that need a little more "balance" between dark and bright, deep and crisp. There is also a high-pass roll-off switch which you can use to attenuate the high frequencies if you want. And to protect the sensitive capsule from high-pressure dynamic levels (in case you decide to use it on drums, for instance) it has -6dB pad, with will attenuate your sound source levels sufficiently. That said, the rap condenser microphone is very good a sufficiently withstanding high sound pressure levels on its own, as its maximum SPL is 130 dB, which is very good (again, especially for the price). The frequency response is consistent also with the requirements of what you’d need to record excellent rap vocals. Being responsive from 30 Hz to 20,000 Hz, the microphone certainly has a preference for mid to higher frequencies so that vocals can shine with clarity over powerful beats. The microphone is also quite silent. It doesn’t have the lowest self-noise there is out of all the rap condenser microphones on this list, but it measures in at a cool 20 dB, which is sufficiently low for recording your rap vocals. When you purchase the microphone you also get a hard mount microphone stand adapter. However, a shock mount would've been better, and would require an additional purchase, as the sensitive capsule will register vibrations coming from the floor. The majority of reviews from customers that have purchased and used the microphone have been overwhelmingly positive. Most like the “warm” and mellow sound of the microphone, which is rich but transparent. Many note that it is far better than the price the microphone actually costs. Others like the fact that the high-pressure capsule plus pad made it flexible enough to use on practically any other sound source besides rap vocals. The only complaint you could find is the minimal accessories that come with the microphone. As a rap condenser microphone, the MXL V67GS is excellent. One of the best condenser microphones out there when it comes to value for money. Plus, it is super versatile and capable of a lot more than only recording vocals. If you’re on a budget, you should get this while it lasts. When it comes to vocal condenser microphones, the Rode NT1-A rap mic is one of the most recommended microphones out there on the market. It tends to be the producer’s or engineer’s choice for any kind of vocal recordings, and this includes rap vocals. But while other microphones would be considered bright, with that modern “in your face” sound and presence which is popular for the modern rap sound, this microphone can be considered smoother and warm, with a full bodied tone. This might be more suitable for some styles of rap that require more of that “silk.” Also, for the price, it is difficult to find a superior microphone on the market. And it could easy replace any other microphone on this list. The Rode NT1-A rap mic has that classic, side-address condenser microphone look. There’s no frills about it. It feels solid in your hand and gives the impression of quality and dependability. It’s also one of the lighter microphones on this list, weighing at just 0.7 lbs., sizing up at being 7.5 inches tall and 2 inches wide. The makers of the Rode microphone are also so confident in you being satisfied with it, that they offer an incredible 10 year warranty on the microphone when your register the product online. This is, of course given that you realize it is a sensitive condenser microphone. Rode has built into the microphone an high quality metal headgrille as well as a thin pop screen. Both of those offer double protection for the sensitive 1-inch capsule from high pressure plosives that is common in rap vocals. However, one would still recommend using a pop screen for recording rap vocals with this condenser microphone. Luckily, one is provided in the package. Something which makes this an excellent bargain. The Rode NT1-A, as mentioned before, uses a 1” capsule that has a fixed cardioid polar pattern. It uses the side address orientation, and does a very good job of minimizing the sound coming from behind the microphone, or to its sides. There is a frequency response of 20 to 20,000 Hz, which is typical of a condenser microphone, however, the microphone remains flat with a small peak at around 120 Hz. This presence peak is what makes it suitable for giving vocals that “presence” required in a mix. However, it is tastefully done, as this you'd find that his microphone sounds less "bright" than other models. The microphone has a warmer sound than is typical in some other microphone models, and is credited with having that premium vintage sound that you’d find in microphones for a much higher price. Also, the NT1-A rap mic has a low-frequency bump at around 150 Hz. This adds more “body” to vocals. So if you’re concerned about getting thin sounds in your rap vocals, this microphone will do a good job at beefing up your vocals without the need of too much processing. It’s for this reason that many producers find that when using the Rode NT1-A on vocals, there was very little need EQing anything. When you purchase the Rode NT1-A rap mic, you get one of the most complete packages out there. This includes everything you’d need to get going right away: a pop shield, shock mount, a 20-feet microphone cable, dust cover, and instructional DVD with recording tips. Some consider this best studio microphone for rap vocals. As I mentioned, users like it for its warmth, full bodied tone, and clarity. Very difficult to find a reasonable dissatisfied customer. Some even consider it better than more expensive mics. Only downside is the lack of a pad or filter. The Rode NT1-A is a great all round microphone for any vocalist. But it is just as suitable for rap vocals as well. It’s value for money is unbeatable at this price, and is a safe choice to get, even if you could spend more. The Neumann TLM 103 is one of the most recommended condenser microphones for rap music on the market. It’s a classic microphone that’s popularly used on vocals as well as on acoustic guitars, and continues to enjoy success. It is the microphone of choice for singers like Beyonce and Justin Timberlake. But one of the areas where it enjoys particular success is in capturing that modern rap sound – an “in your face sound” that is bright and very well defined in details, especially when it comes to the lyrics. It is not a “budget” condenser microphone, if that’s what you were looking for, but rather a premium microphone that gets its users premium results. The word that I’d use to describe the design of the Neumann TLM 103 rap mic is classic. In fact, many of the microphones from the Neumann line have the same design aesthetic. But this microphone, despite its price, was created by Neumann as their more “affordable” version. The microphone has a solid design that feels like quality. It is a side-address microphone, meaning that you point it from the side, where the red Neumann logo faces you. It has a large classic designed wire mesh grill that protects the sensitive capsule. It can also act as pop filter for plosive sounds (one would still recommend getting a pop filter). The condenser microphone itself has a matte black finish that gives it that smooth high quality look. You can also get it in nickel. It also includes a swivel mount, making it easy to position on a microphone stand. The Neumann TLM 103 is excellent for rap vocals thanks to its large diaphragm condenser, which is both sensitive to high frequencies, and giving the lower frequencies in lower male bass vocals the power it requires. In fact, it is the condenser microphone of choice for speech as well. The polar pattern of the microphone is cardioid, which credits it with generous attenuation of unwanted sounds in the room, since it will pick up what is right before it (you, or your rap vocalist). It’s also good at naturally rendering off-axis sound with great isolation. This will minimize the amount of feedback you get if you plan to use it in a live situation. The frequency response is from 20 Hz to 20,000 Hz, with a smooth yet prominent presence peak, which is what gives it that “sparkle” that makes many of the modern rap vocals sound crisp. If you want to attenuate the low frequencies, you have selection of 3 different high-pass filters, which can roll off any unwanted rumbling from recordings. The Neumann TLM 103 rap mic is a very sensitive microphone, but at 138 dB SPL, it also has one of the most pressure resistance capsules on the condenser microphone market. The internal circuitry is also transformerless, which means zero interference from your other gear. It’s also a very silent microphone, one of the most silent microphones that I recommend. It measures a self-noise of only 7dB. This means that there's much less of the “microphone” that you will hear through the recording. Purchasing the Neumann TLM 103 for rap vocals will not leave you without some needed accessories. Included with the swivel mount, there is a very nice solid wood box for carrying the premium microphone around, and a high quality stand mount. As you’d expect from a microphone used by some of the pros I mentioned, there will be little complaint about the Neumann TLM 103 rap mic. Primarily when it comes to recording rap vocals from a condenser microphone. The majority of buyers consider the sound “the truth,” giving you exactly what you need, without any coloring. The only minor complaint I could find is from a few users who found the use of a de-esser necessary at times, as the brightness of the microphone could cause some sibilance in a mix. Another complaint is the lack of pad or filter. However, if you can afford this mic, you probably can afford great quality preamps to use with it. The Neumann TLM 103 rap mic is a safe microphone regardless of what sort of vocals you want to use it on. But it particularly shines for rap music, and has become one of those microphones that producers and sound engineers of rap vocalist reach for as default. If you want to get the modern classic, get this. 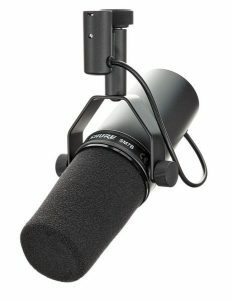 The AKG Pro Audio C414 XLII rap mic is one of the most famous vocal condenser microphones on this list. It is a legend in the field, with a sound modelling the original legendary AKG C12 vintage microphone from 1953. Naturally, it is also considered very good for rap vocals, as many rappers, like Joe Budden for example, have used it to record their vocal tracks. There are two versions of the C414, actually. But ensure that you get the correct one, as the XLII is matched best with vocals (XLS for instruments). The cheaper version, the C214, is comparable, and many say that it is essentially the same. But those who have had both recognize that the C214 actually has a lighter sound which may not be suitable for the lower tones of a male voice. The sound of the C414 XLLII for rap vocals is characterized as balanced and clean in comparison. For this reason, it is also one of the most widely used spoken word and broadcasting microphones out there. The AKG Pro Audio C414 XLII rap mic has one of the most recognizable designs in the industry. And also has one of the most recognizable sounds as a true “professional grade” microphone. If you’ve walked into a professional music or broadcast studio, you’ve probably seen this. It is a side address microphone with the logo facing in the same direction as the receiver. The microphone’s design also allows for high convenience. On the front is the switch for easily selecting between the polar patterns. On the back, there are two switches, one selecting the pads for attenuation, the other for low pass filter selections. There is also an LED light on the front that detects overload peaks. Despite the full features, the microphone is the lightest on this list, weighing just 0.66 lbs. The body of the microphone itself is sturdy. It comes in grey, with the mesh grille in gold on the front, and black on the back, translucent enough for you to see the capsule situated in its internal shock proof compartment. The sound of the AKG Pro C414 XLII rap mic can be called “pristine.” It has a signature “upfront” sound with plenty of “body,” making it well balanced. This makes it the microphone of choice for lead singers and rappers, in the studio, or live. It's sound quality is thanks to the sensitive condenser capsule, which has a flat response with a slight presence boost. This microphone is also described as giving recordings a unique "ambiance." The microphone also, as mentioned, has a selection off bass cutoff filters. There is also a selection of three pads, -6dB, -12dB, and -18dB. Another great feature that the C414 XLII has that the other microphones in this list doesn’t, is the selection of polar patterns. There are a total of five to choose from. This include omnidirectional, bi-directional, wide-cardioid, cardioid, and hyper-cardioid. A very good option to have when you want to have microphone pairing options for utilizing the Blumlein and Mid-Side recording techniques. The frequency response is 20 to 20,000 Hz, and remains balanced throughout the spectrum. Another cool beneficial feature is that the C414 has the highest sound pressure level on this list of 140 dB. This means there is some flexibility of using it even on drums and bass amplifiers. The microphone is very quiet as well, registering a self-noise of only 6dB, the second quietest on this list. This is thanks to high quality internal circuitry, but also the internal shockmount that prevents the capsule from registering unpleasant floor and microphone sound noises. In addition to the microphone itself, you will get other accessories to get your vocals recording immediately. You get the AKG professional grade pop filter, a shock mount, sleeve, and a metal carrying case. You also get a printout of the microphone's frequency response across various settings. Some who have used this microphone have considered it a “game-changer.” Mostly because it was able to bring out the degree of clarity often missing when using a cheaper vocal microphone for rap music. It also gets a lot of praise for being versatile. One customer said he could not think of a situation where this microphone couldn’t handle. The AKG Pro C414 XLII rap micis a standard in the industry. It’s a nice middle ground between “bright” and dark. If you’re looking for that balance, yet want something that’s more “upfront” with plenty of versatility, and you have the budget, this could be the microphone for you. The Aston Origin rap mic is a fairly new microphone to the market, and a great medium budget condenser microphone for rap vocals. It’s also one of the most highly recommended for vocals overall, with plenty of positive reviews from satisfied customers. After researching this microphone, it made sense not to leave it out of a rap mic review guide. For the price, it offers a lot of value, from its high-end transformerless circuitry, to the gold-evaporated capsule. The microphone is credited with having a sound that is open and transparent, that will deliver shimmering harmonics, capturing all the treble details in the vocals without any kind of harshness. The Aston Origin rap vocal microphone is beautiful to look at, one of nicer ones on this list in my opinion. It has a cylindrical body design made out of 2mm thick silver solid stainless steel that is laser cut and etched. There's no paint on it, so there's no fear of stripping paint causing the mic to appear visibly aged with use. It is also super convenient, being light and small, at just 0.99 lbs., under 5 inches tall, and a little over 2 inches in diameter, it’s super easy to carry. But the convenience also continues with the built in interchangeable mic stand adapter, meaning you can just mount the microphone onto your mic stand without any need for additional mic stands. The most unique thing about it, however, is the waveform mesh grill head. The grill acts as a protective shock-resistor for unwanted dings. It can take blow, get dropped, and change shape and return to original form, all without damaging the sensitive capsule. It also doubles as a pop filter, which can be convenient if you decide to save on getting one. The Aston Origin rap mic has a lot of great feature that make it great as a condenser microphone for recording rap vocals. The capsule is a one-inch gold-evaporated, large-diaphragm pressure-gradient condenser, which makes it capable of picking up low to high frequencies in a rapper’s voice. The frequency response is 20Hz to 20,000 Hz, and it has a decently low self-noise of 18 dB. The microphone is direction, picking up a fixed cardioid polar pattern, but also offers a degree of off-axis rejection. This is useful for minimizing the amount of unwanted ambient noise your condenser would pick up in the room, from your laptop and other gear. The microphone is very flexible as well, and can be used on a variety of sound sources. This is thanks to its -10dB pad, and 80Hz low pass filter. That means you can use it on high pressure level instruments without worry about damage to the sensitive capsule. The maximum SPL, by the way, is 127 dB. It also has its own internal shock absorber, which is good for keeping the capsule from picking up vibrations from the floor through microphone stand. The Aston Origin is also credited at sounding smooth and clear. This is thanks to unique internal circuitry that gives the microphone non-linear voltage/current source rectification. This allows it maintain a controlled amplification that doesn’t distort the audio. The majority of users of the Aston Origin rap mic are happy with the product, considering it to be the best for the price range, and for the money. Users have found that even without any editing and processing, vocals sound good, with a big, open, bright yet warm sound that can provide the sort of “boom” that rap vocals need. The only valid criticism that I could find is that the high pass filter wasn’t all that effective on male lower sounding male vocals. For a medium price condenser microphone for rap vocals, the Aston Origin rap mic is probably the best there is out there. It has a beautiful, quirky design, and its clean harmonics will keep you from wanting to load up your vocal EQ plugins. Certainly a top recommended buy. The AT2020 for rap vocals aims to deliver the trademark Audio-Technica quality and performance at a great price. It's designed to capture everything from the delicate nuances of acoustic guitars to screaming Marshall stacks, the mic is also suited for a wide variety of vocal performance styles as well. The AT2020 is as versatile as it is affordable. The cost of even two of these would fit easily into most anyone's budget, so it is perfectly feasible to get a pair and have an esoteric stereo pair set up for capturing vocals. Its ability to capture a wide dynamic range and to handle high SPLs make it a great choice for recording rap vocals. At first glance, the AT2020 immediately inspires confidence with its simple and straightforward form. It's built to withstand the rigors of the studio and the road, its design is clearly focused on functionality and durability. The black metal body is rugged and pretty stylish, and the threaded stand mount allows you to position the mic as needed. The mount also provides easy access to the XLR jack, and there is a reassuring ‘click’ that lets you know that the mic cable is locked into position. Surprisingly for such an inexpensive mic, the AT2020 is made almost entirely of metal. It has a nice heft to it that suggest a much more expensive piece of studio equipment. Although the AT2020 is versatile enough to handle a wide variety of audio sources, it definitely shines as a rap vocal mic. The high SPL capability and the wide dynamic range make it a great choice for capturing rap vocals, giving them an upfront and “in-your-face” quality. Put simply: if vocals recorded with the AT2020 somehow still end up sounding wimpy, the mic probably isn't the issue! The AT2020 is fitted with a low-mass diaphragm that extends the frequency response and provides excellent transient reproduction. The midrange is nice and present without being too strident, and the bottom end always remains tight and manageable. The AT2020 managed to surprise even experienced music producers with its versatility and consistent performance. Even audio engineers that have several mics to choose from routinely turn to the AT2020 when the situation calls for a good all-around vocal mic. Other users like the balanced frequency response, the low noise, and the pleasing midrange reproduction. The AT2020 would be an impressive mic even if it costs a couple of hundred dollars more. It’s almost unbelievable how clean and balanced it sounds for the price that it is going for. Whether you are looking for a decent first condenser mic or an all-rounder for impromptu recording sessions, the AT2020 will deliver a whole lot of performance for not a whole lot of money. Experienced audio engineers and music producers are probably well-familiar with the AKG C414. One of the most revered condenser mics under the AKG brand, it has been used in countless tracks in various genres. Now, all the great sound, presence, and clarity of that legendary mic is available in the C214 for rap vocals. Equipped with the same 1” dual-capsule as its older sibling, the C414 compresses the circuitry into a more compact cardioid-only, single-diaphragm design. All the detail and upfront sound quality has been retained however, so you get the classic C414 performance at a more affordable price. The C214 is custom-engineered for superior performance and durability. The 1” capsule is mounted on an integrated suspension that reduces mechanical noise and unwanted resonance. This ensures perfect sonic accuracy of whatever source you are recording. This feature is especially beneficial for recording rap vocals, with which clarity is often a primary concern. Around the capsule is an all-metal, double-mesh grill that protects the mic’s inner workings. The dent-resistant grill also reduces RF interference without hindering acoustic performance. In fact, the entire mic is solidly built, with a scratch-resistant exterior and a gold-plated XLR connector. The overall feel is of a high-quality unit that upholds the proud AKG tradition admirably. The C214 follows in the tradition of AKG’s large-diaphragm mics with a very respectable dynamic range of 143 dB. This ensures that everything it picks up is captured with lifelike accuracy and precision. Transients remain remarkably well-preserved, and the resulting sound is as rich and full-bodied as you could hope for. Rap vocals are printed to tape or disk with uncompromising quality, with total clarity and detail. Although the AKG C214 excels as a vocal mic, it is capable of handling even loud and full frequency sounds as well. The low-cut filter and 20-dB attenuation pad–which is switchable–gives it the ability to handle as much as 156 dB SPL. Users expecting the trademark AKG richness and quality seem well-pleased with the C214, which has the warm and smooth midrange associated with the brand. Many users mentioned the mic’s ability to flatter their vocals, making most any performance easier to fit into a mix. Most users seem to get away without having to EQ vocal tracks extensively, although some achieved better results by taming the high-end just a touch. The AKG C214 is an amazingly versatile mic that carries on the proud AKG tradition while imparting its own unique character into the mix. If you are dead set on getting that classic warm and creamy AKG midrange on your tracks, the C214 will do you for a very reasonable price. The Aston Spirit for rap vocals may not be quite as well-known as some of the models you will see in your typical rap producer's mic locker. 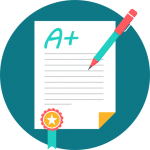 Nevertheless, it definitely has the quality and features to stand up to the best of them. A tremendously versatile high-performance mic, it has three switchable patterns and a 1” gold-evaporated capsule. Within this capsule is a state-of-the-art transformer-balanced circuit built from the finest available components. The Spirit can be used to capture most any signal source, but it excels at vocal and acoustic recordings. It imparts a wide open and crystal clear sound on any track, with all the rich harmonics preserved. The Aston Spirit rap mic represents a departure from the company’s fixed-cardioid Origin mic, which caused quite a stir among recording engineers for its clear and open tone. The carefully selected capsules feature extremely high-quality electrical components, and the mic itself is designed, built, and tested in the UK. Although the Spirit was originally intended to have WIMA capacitors, it was later decided to go for a higher-spec’d capacitor that exhibited better dielectric properties and improved temperature stability. The exterior of the unit is pretty simple and straightforward, with a rugged and industrial look. The housing is fitted with a unique ‘spring’ cage made of stainless steel instead of the typical basket. This provides protection from impact, with the cage easily re-centered when it is knocked out of place. The Spirit offers a choice between three patterns: cardioid, omni, and figure-of-eight. This gives it the versatility to handle most any recording application, so you won't have to spend a lot of time switching between different mics. A pad switch is included that lets you select between 0dB, -10dB, and -20dB attenuation settings. You can also activate an 80Hz low frequency roll-off via a handy toggle switch. The Spirit has a frequency response range of 20Hz to 20kHz. Set to cardioid and omni, there is a slight hump at around 10kHz, which gives clarity and presence to the recorded sound. Set to the figure-of-eight pattern, the hump is set to around 6kHz. Users accustomed to placing a pop filter in front of their mics were pleasantly surprised to find that this was often unnecessary with the Aston Spirit. The mic seems remarkably resistant to popping noises, although more detailed recordings do benefit from a pop filter. When set to the cardioid pattern, users noticed a clean and balanced sound free from the phasing and ‘honk’ associated with cardioid mics. 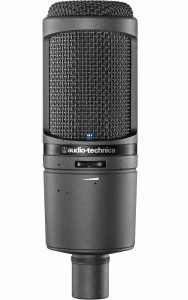 The mic has an overall natural and pleasing quality that makes it ideally suited for recording vocals. The Aston Spirit offers boutique performance in a hardy and durable mic that costs less than other similar models. The rough and rugged casing is actually quite attractive, and conceals some pretty sophisticated electronic circuitry underneath. If you are looking for a good all-around mic that is a bit off the beaten path, the Spirit is worthy of serious consideration. Shure is one of the most respected–and most familiar–names in the microphone industry, and it is easy to see why. With a lengthy history of producing some of the finest mics in the business, it adds to its already formidable lineup with a dynamic mic that could very well be a future classic. Called the SM7B, it is characterized by a smooth and pleasantly-flat wide frequency response that makes it suitable for recording a vast array of sound sources. The model has recently been updated to provide enhanced stability, while retaining the trademark quality that SM7B has been known for. The SM7B for rap vocals is designed to eliminate the noisy electronic hash that is pretty much part of the modern home studio experience. The mic features superb electrical shielding that prevent electromagnetic hum from seeping into your tracks. The recent update has resulted in an enhanced bracket design that makes for a much more stable mic. The standard windscreen is still included, although you now have the option to use an A7WS windscreen as well for more intimate speech recording applications. The SM7B still has the trademark Shure ruggedness and durability. The cartridge is well protected against impact, ensuring dependable reliability for years to come. In terms of frequency response, the SM7B as a rap mic delivers a flat and pleasing sound with most every frequency well-balanced. Vocal tracks are recorded with clarity and precision, with all the natural quality retained. Controls are provided for rolling off the bass and boosting the mids slightly, and a graphic display is helpfully provided that lets you know where the mic is set. The electrical shielding is amazingly effective. This means you won't have to take any additional measures to get rid of electromagnetic hum from computer monitors and other electrical equipment in your studio. Users of the Shure SM7B seem quite impressed with the mic’s ability to capture clean and crisp recordings. The sound quality is surprisingly pristine, even in situations wherein some noise is to be expected. Some users did find that a quality preamp is necessary to make the SM7B truly shine. One user reported being less than impressed with the mic at first, only to change his mind completely after plugging it into a good preamp. Users looking for a good vocal mic that can handle a variety of other sound sources as well should seriously consider the Shure SM7B. Despite its reasonable price, it delivers performance and quality at par with more expensive models. If you do opt to purchase this mic, make sure to invest in a good quality preamp as well in order to make it live up to its full potential. In all the buyer's guides on this site, there is a section that tells you how to make the perfect choice for you. This guide is no different. 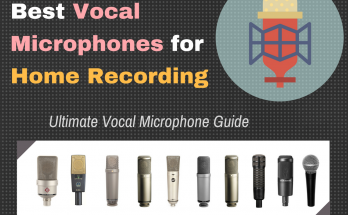 However, whereas the previous vocal microphone buyer's guide focuses on vocal mics in general, this guide is specified for rap vocals. So let's look at how to find the best mics for rap. There's a reason why there are so many microphones... because they all sound different! Some microphones are considered "bright" or "crisp." Others are "warm," "deep," "full-bodied." Generally speaking, a condenser microphone will be brighter than a dynamic microphone. And there's a reason for that... the capsule's diaphragm is very pressure sensitive, and hence more responsive to higher frequencies, such as in vocals. That's why, more often than not, you will see a condenser microphone recording a vocalist than a dynamic in a professional studio. That said, when looking for a good rap microphone, it's good to keep in mind what sort of vocal tone you're looking to get as a result. For example, do you need a deeper, rounder tone? Do you need something that's bright and clear? Or you want more of a balance? Each rap microphone in this guide has a frequency response graph below the description and review. Looking at the frequency response graph will give you a good estimation of how the microphone will affect the quality of your vocals. Generally speaking, a microphone that has a fairly significant bump at the lower end of the graph would produce a deeper tone in vocals. An example of this is the Rode NT1-A. On the other hand, a microphone that has a generally higher bump in the "presence" frequency range (about 4 to 6 kHz) of the frequency response graph will produce "bright," "crisp" and "up-front" vocals. An example of this microphone is the Neumann TLM 103 for a premium rap mic, and the Aston Origin as budget rap microphone. If what you want is a generally balanced tone of bright and deep, look for a frequency response graph that remains generally flat throughout, with just a small peak in the "presence" frequency range. Good rap condenser microphones that provide this balance are the AKG Pro Audio C414 XLII for a premium rap mic, or the MXL V67GS for the low-cost rap mic. Why use a condenser for rap vocals? When you're recording rap vocals, the most important qualities you're looking for is the ability for the rap vocalist's words to be understood clearly, and for there to be a certain "punch" to the vocals that makes it stand out over a generally low-end prominent beat. So choosing a microphone that maximizes these qualities vocals is essential. As you may know, there are two types of microphones: Condenser and Dynamic microphones. Neither is considered "better" than the other, but we need to look at a few important distinctions, quality-wise, to determine why'd we want to get a condenser microphone for rap vocals. Dynamic microphones are often characterized with a warmer, full-bodied sound that is typical for recording instruments like bass or drums. This is thanks to the diaphragm that they use, which is not unlike a speaker woofer operating in reverse. They will be good at capturing vocals, but the emphasis on the low may lead to a muddy sound you'd have to EQ once you start mixing the beat. As mentioned, the crispness and clarity of condensers are a result of the special sensitive capsule used that respond to sound pressure. For this reason, they are also fragile and must be handled with care, particularly when used on loud sound-sources. Can you hear the lyrics? What's more important than anything else when listen to a rap song? The lyrics. Speech and rap vocals tend to require the most detail and clarity more than any style of vocal recording. Condensers are generally the top choice. So when professionals think of using a good vocal microphone in studio or broadcast, engineers and producers end to reach for the condenser. However, if you were curious, a dynamic microphone that gets a lot of good reputation among rap vocalists and producers is the Shure SM7B. It is generally a broadcast microphone, with a very round and full bodied tone. Hopefully, by the end of the guide, you would've been able to identify the mic you wanted from a narrow selection, based upon your budget, and style of microphone you'd like. Our hope was that you were able to get the best choice, that, no matter which one you chose, either way you should be satisfied. If, on the other hand, you were reading this post out of curiosity, let me know in the comments what you think is the best rap vocals, and why. You can also share if your microphone made the list, and what your personal views on the microphone are. This is the result of hours and days of research. Data was aggregated from forums such as Gearslutz.com, Reddit’s r/WeAreTheMusicMakers thread, product reviews, and buyer reviews from pro audio owners. Ratings from Amazon as well as other online retailers were used to determine which condenser microphones per category and price range was the best rated, and had the most ratings, and then compared that against forum reviews, user testimonials, and personal experience (where applicable).